Travel trailers fulfill their function, but they seem out of place at the feet of all the clean, modern buildings we see going up. We’re seeing more and more customers in the multi-family and office space rental industry request branded shipping container leasing offices as turnkey work space solutions—and we’re loving the results. We deliver shipping container leasing offices with turnkey power, climate control, interior finishes, bathrooms, and doors and windows. The customers then treat the containetr as a blank canvas and add their brand with exterior decals and interior design decisions. What starts out as a shipping container turns into a tidy, stylish space for meeting future residents—even before construction is complete. A permanent feature, or just passing through? 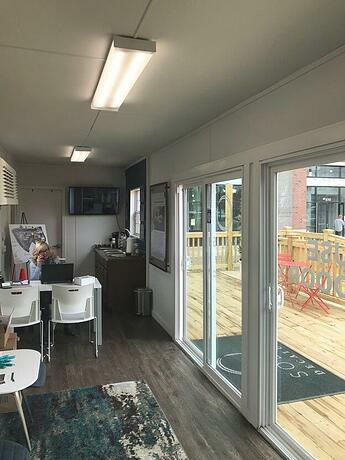 Shipping container sales offices are designed to go directly on the ground without stairs or ramps, and we’ve seen customers take this route when speed is the priority. If there’s a flat, level, and dry space a forklift can place the leasing office on bare earth or concrete in a matter of minutes. Then, it’s just a matter of having an electrician connect the office to power. Others choose to make the shipping container a long-term resident of the complex. For example, in the photo above, the customer chose to lift and block the office and attach it to a porch area for a homey looking waiting area. 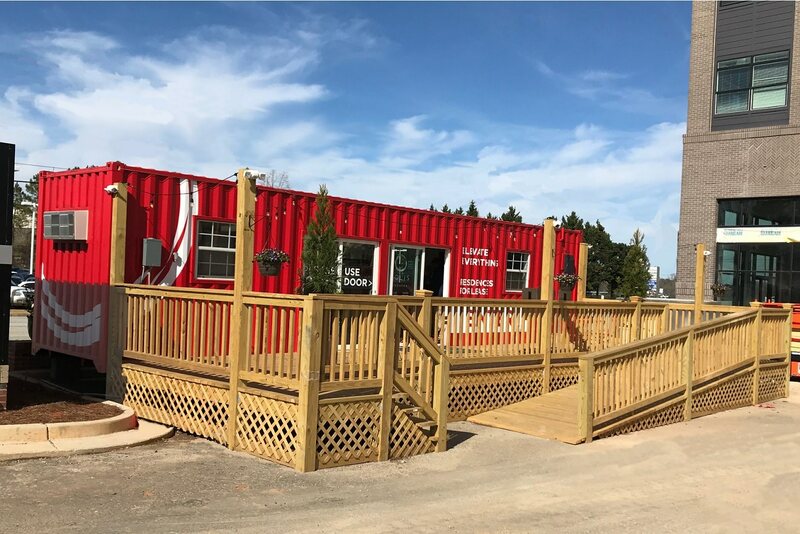 Once the development is complete, the apartment complex owners can pick up the container and send it to the next construction site, but often the shipping container sales office is repurposed for other uses on the property. It’s easy to relocate the container to an area like a court yard and transform it into a resident technology center, a meeting room, or a coffee nook. Unlike travel trailers, shipping container sales offices have an industrial chic aesthetic that residents and landlords alike can sign onto. Blog: What’s the Difference Between a Ground Level Office and an Office Trailer? Standard floor plans for shipping container offices.